Studio Line: Dimension Films - It will take two Immortals to defeat the ultimate evil. But in the end there can be only one. For the next electrifying chapter in this wildly popular action-packed legacy, Highlander: Endgame teams big-screen star Christopher Lambert (Highlander I, II, II, Mortal Kombat) with the Highlander TV series star Adrian Paul. To combat the fearsome Highlander villain and his ruthless band of immortals, Connor (Lambert) and Duncan (Paul) join together in a power play for the ages! But even though it will take the combined strength of two Immortals to win this fight, in the end there can be only one! Bold, exciting and tremendously entertaining -- you don't want to miss this epic struggle of good versus evil! Box Office: Budget: $15 million. Opening Weekend: $6.223 million (1543 screens). Gross: $12.801 million. DVD: 2-Disc set; widescreen 1.85:1/16x9; audio English DD 5.1, Spanish & French DD 5.1; subtitles none; single sided - dual layered; rated R; 101 min. ; $29.99; street date 2/20/01. Supplements: Feature Commentary Track With Producers Peter Davis and William Panzer, Editor Robert A. Ferretti, and Co-Executive Producer H. Daniel Gross; An Earlier Full-Length Cut -- 100 Minutes; Behind-The-Scenes Featurette; Interactive Game "There Can Be Only One"; Deleted Scenes; Visual Effects: A Historical Progression. DVD-ROM Features: 3-Round Game "There Can Be Only One"; Character Timeline; Script-To-Screen Feature. Is it just me, or aren’t sequels only supposed to be made for movies that are hits? I guess I’m just old-fashioned, for in 2000, we got a whopping fourth Highlander film. Coming 14 years after the original, apparently the new flick - Highlander Endgame - has more to do with the universe of the Highlander TV show than the original movie or its sequels. At least that’s what I read somewhere, but I can’t say for a fact. That’s because I know very little about the whole Highlander world. I saw the first flick theatrically and then watched it again last year on DVD. I also took in the sequel when it hit screens in 1991, but that clunker was that last time I showed any interest in the saga. I knew that a third movie appeared at some point after that, and I had some vague recollection that there’d been a TV show as well, but that was about as far as my knowledge went. A quick trip to IMDB indicates that not only did we get a third film and a moderately long-running (six seasons) TV series, but other televised activities occurred as well. Apparently Highlander also branched out to a second TV series plus an animated show! Who knew? Anyway, the story offers little more depth than the standard “stop the bad guy” motif. It attempts some emotional depth through Duncan’s semi-reinvolvement with former flame Kate (Lisa Barbuscia); now known as “Faith”, it seems she’s not to pleased to be an Immortal, and (correctly) blames Dunc the Hunk for her fate. Not that any of this really matters, for Endgame is about little more than some head-chopping action, and in that regard, it’s not a bad piece of work. Like so many other action movies these days, it takes many of its cues from Hong Kong flicks. In fact, Endgame used a veteran of that scene as fight choreographer; Donnie Yen also acts as one of Kell’s “Posse” of Immortals, and he adds some of the movie’s most exciting moments. Speaking of the movie’s supporting cast, one of the actors in Endgame can be used to demonstrate the ever-widening generation gap! When I saw “The Edge” listed in the opening credits, my jaw dropped. What in the world was the guitarist from U2 doing in this flick? However, it’s a different Edge; apparently this one’s a pro wrestler. I’d never heard of him, and at the risk of sounding like a snob, I’m proud of that fact! Despite some nice thrills from Yen, Highlander Endgame never rises above the level of “pretty decent”. I enjoyed some of the action sequences, and director Douglas Aarniokoski manages to make the film look fairly good, but the movie simply lacks the substance or style to be anything more than pedestrian. Ultimately, it’s a watchable and moderately entertaining little action flick, but it’s nothing particularly special. 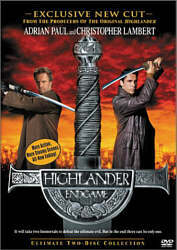 Note that the DVD release of Highlander Endgame offers an extended cut of the film. This one runs about 14 minutes longer than the original theatrical edition. Since I never saw that version, I can’t directly comment on the differences, but a search at IMDB will indicate the changes others witnessed. Highlander Endgame appears in an aspect ratio of approximately 2.35:1 on this single-sided, double-layered DVD; the image has been enhanced for 16X9 televisions. Although the case states that the movie appears in a 1.85:1 ratio, that’s definitely incorrect, as the image is clearly 2.35:1. Bizarrely, the packaging for the DVD release of the original Highlander made the opposite mistake; it claimed the 1.85:1 movie was shown as 2.35:1. Maybe this error is some sort of strange homage to the older DVD. In any case, the movie looked absolutely terrific, with very few problems on display. Sharpness seemed nearly immaculate. At all times, the picture appeared crisp and detailed, with virtually no signs of softness or fuzziness. Jagged edges were absent, but I did see modest shimmering from blinds. Print flaws seemed minor. I detected a few instances of speckles or grit, but that was it. The movie lacked any more substantial defects such as tears, scratches, hairs, blotches or grain. Colors looked accurate and well-saturated throughout the film. HE didn’t offer a terribly diverse and bright palette, but the hues were clear and solid at all times, and they seemed very positive. Black levels appeared deep and rich, while shadow detail came across as appropriately heavy but never excessively thick. All in all, Highlander Endgame provided a very satisfying visual experience. The film’s Dolby Digital 5.1 soundtrack also seemed quite strong. The soundfield was nicely immersive and engaging throughout the movie as audio consistently surrounded me. The forward channels provided broad and well-localized sound that seemed appropriately place; these elements meshed together neatly as well and created a realistic environment. The rears also offered a strong level of involvement as they bolstered the front channels with excellent ambiance and a great deal of split surround usage during fights and other dramatic scenes. Audio quality seemed fine. Though much of it must have been looped, dialogue sounded crisp and natural, with only a few signs of edginess and no problems related to intelligibility. The score was bright and dynamic. During a few scenes, I thought the low-end could have sounded a little deeper, but for the most part the music came across as clear and bold. Effects provided a strong impact and they seemed clean and free from distortion. Ultimately, the soundtrack worked very well to back up the action. Despite the fairly low profile maintained by Highlander Endgame - the movie earned a meager $12 million at the US box office - Dimension Films have provided an extremely solid two-disc special edition for it. On the first DVD, we find a few different extras, starting with an audio commentary from producers Peter Davis and William Panzer, editor Robert A. Ferretti, and co-executive producer H. Daniel Gross. All four men were recorded simultaneously for this screen-specific track. Although I didn’t think this was a bad commentary, it didn’t offer much that seemed terribly compelling. On the positive side, the participants provided an occasionally-solid view of what it’s like to make a movie in an unusual locale. Due to cost issues (ie, it was cheaper), most of Endgame was filmed in Romania, and we learn about all of the obstacles this decision caused. However, the location becomes too much of a focus, and a lot of the commentary simply provides dull details of the specific area in which shots were filmed. Ultimately, the track provided enough good info to merit a listen for fans of the movie, as a whole it was a moderately lackluster piece. Also on the first DVD are a few other extras. We get an interactive game called “There Can Be Only One”. This contest actually directly ties in to six Easter Eggs found on disc one. Each of these offers a little tidbit about a character or a minor outtake. They’re mildly interesting on their own, but they also function as answers to trivia questions for the game. When you play “There Can Be Only One”, you have to answer 16 questions in any of three different difficulty levels. Three options are provided for each problem, and if you get one incorrect, the game ends. If you get to the end, you’re “treated” to a brief video montage. The length of the piece depends on the difficulty level; not surprisingly, the clip after the end of level 3 is the longest. Actually, I found the questions to seem equally tough on all three levels, but in any case, the “prize” was a disappointment; 16 questions is a lot to cover for that cheesy montage. More interesting is a nice demonstration reel called “Visual Effects: A Historical Progression”. Here we see 36 minutes and 45 seconds of effects footage, all of which is accompanied by commentary from editors Michael Knue and Robert Ferretti and visual effects supervisor Alison Savitch. The program shows a variety of different effects shots from the film in different stages, and the participants remark upon the techniques used and the challenges faced. It’s a good look at the way all of the elements came together. In addition, we find three “Deleted Scenes”. These last between 65 seconds and 125 seconds for a total of four minutes, 40 seconds of material. None of them seemed terrible interesting, but I was happy to find them here nonetheless. Finally, DVD One includes some DVD-ROM materials. We find another version of the “There Can Be Only One” game. Although this one lasts for three rounds as well, it’s a much tougher contest. The first round recycles questions from the other game, so it was easy for me. However, round two became much more complicated. Each question may have zero, one, two or three correct answers, and if you get three of eight wrong, you’re “dead”. I tried my best to make it through this round, but I couldn’t do so. Actually, I suppose if I kept going, trial and error would eventually get me to the end, but since a loss in round two ends the game and forces you to repeat round one, I got too tired of it to finish. Maybe some other day I’ll attempt it again, as I’m curious to see how difficult round three must be, and I’d also like to know what your “prize” is, but right now I just can’t take anymore beheadings! We get a “Character Timeline” for 14 participants of the film. These show significant events in the peoples’ lives and let you track them through the years. It’s a fun little feature that helps flesh out the characters, especially the less well-developed ones. “Script to Screen” shows the movie in a small box and offers the script on the right side of the screen. In addition, an area beneath the film displays producer’s notes about HE when appropriate, and various icons indicate when there were substantial changes made to the movie. Orange text denotes material that wasn’t included in the final film. It’s a great little piece for fans of HE. The DVD-ROM area also provides some Internet links. Here we find connections to the official sites for Dimension Films, Highlander, and the “Miramax Café”. Taking a cue from Anchor Bay special editions like Halloween, the second DVD includes an alternate cut of the film. This piece starts with a brief audio introduction from the director who explains the number of cuts through which a movie goes, and indicates that this was one of the early ones. As such, it came straight from the Avid editing system and lacks finished effects and score. It also varies in its aspect ratio; most of the movie appears as 2.35:1, but some shots looked 1.85:1 and many were fullscreen. Because it came from the Avid, the quality of the presentation seems fairly weak. The picture looked fuzzy and showed occasional numerical markings used during the editing process. However, the audio quality wasn’t bad, as the Dolby Surround 2.0 soundtrack seemed less dynamic than the feature film’s 5.1 mix but it was adequate. Not that it mattered, for the alternate cut of HE is best left to absolute Highlander obsessives. Frankly, this cut wasn’t remarkably different than the final version. It added a few scenes; some were new to the movie, while others were longer editions of final segments. Also, some parts of the film were rearranged and put into different places. While I didn’t find the alternate edit of HE to interest me much, I nonetheless think it was a nice addition to the DVD, especially since the package maintains a standard list price for Buena Vista’s offerings; unlike rip-offs like the “Limited Edition” of Manhunter, the cost of HE hasn’t been jacked up to cover the second DVD. In addition to the alternate version of the film, disc two includes a “behind the scenes featurette”. However, that description is rather deceptive. When I hear something termed a “featurette”, I expect a brief, promotionally-oriented piece of fluff. That’s not what we find here. While this 56-minute and 55-second program isn’t one of the all-time great documentaries, it’s definitely an improvement over the quickie featurettes found on many DVDs. The show mainly combines interviews with the principals - usually the actors, but also the director, the producer, and other technicians - and shots from the set. Very few film clips appear, which is a pleasant relief, and when we do see snippets from the movie, they’re there for illustrative purposes. For example, toward the end of the documentary, we see behind the scenes footage of a number of stunts, and we then are shown the final product; that process was very helpful, as it let us put the demonstrations into perspective. The second half of the program is easily the more interesting part. During the first 28 minutes or so, we mainly hear about the characters, the story, and the Highlander universe. This was moderately interesting but couldn’t maintain my interest well for such a long period; there’s just not much substance to the whole thing, and someone needs to tell Adrian Paul that he’s taking it way too seriously. While these portions of the documentary were a bit tedious, the situation improved greatly during the second half. It focused on various technical issues and provided a very solid depiction of a number of different elements. I particularly enjoyed the segments that examined the choreography of and preparation for the swordfight sequences; I didn’t know much about this kind of material, so I really liked these parts. Ultimately, this documentary is a flawed but compelling piece of work. In some ways, the same can be said about Highlander Endgame. The movie isn’t anything special but I thought it seemed generally entertaining and watchable. On DVD, the film both looks and sounds great, and this package includes a terrific complement of extras. Ultimately, this is a solid set that should appeal to fans of the Highlander saga.